Extensible Markup Language (XML) is a set of rules for encoding documents in machine-readable form. It is widely used for abstract representation of arbitrary data structure in programming. I wrote down the scientific data of recent significant earthquakes in xml format, and marked every single character or sign on individual stone. Then, I threw the 916 stones into an abandoned coal mine tunnel, Stollenmundloch von Braut, located in Hattingen, Germany. The data is accorded to the National Earthquake Information Center (NEIC). Too many earthquakes have occured recent years. It is enough. If there were any divine being living under the Earth, I just let them know. I threw the stones one by one, in order of the xml coding sequence. I had imported data into the underworld. Programming language is an artificial language designed to communicate instructions to a machine, particularly a computer. I am interesting in its abstract thinking pattern. For example, things are defined into individual objects in object-oriented structures. Events are explained in cause-and-effect logics with the if-else statements. When we ask computers to solve our everyday problems, I wonder how it influences our concept of the World. I have been developing a series of works in the name of “programming the nature”. I wrote programming codes on natural matter. The codes were inevitably scattered in chaos. And the actions are destined to be useless and meaningless. During my residency in ARCUS Project, located at Moriya, Irabaki, Japan, I re-wrote their citizen charter in programming code, and marked every single character or sign on individual cookie. 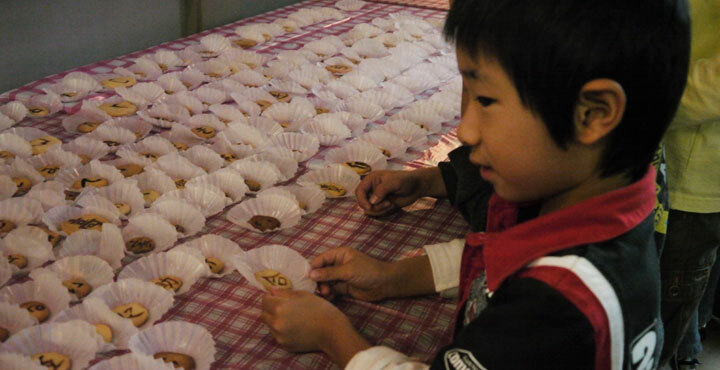 Eight hundreds of cookies were baked with the help of locals, and served to guests in the day of open studio. In my logic, I had executed the program in human body. The citizen charter was established in 1990. It wrote down the Moriya citizens' commitments to love each others, their family, as well as the natural environment, and their wishes of building up a peaceful and healthy city. The charter is hanged on every public spaces such as libraries, schools, and community centers. However, as same as other official and institutional documents, nobody is aware of its existence.